Building Bridges was a neighborhood-focused collaborative public art project in partnership with Kanesville Alternative Learning Center and the Kanesville-Tinley neighborhood in Council Bluffs, IA. The Bemis Center’s Community Arts program and artist Therman Statom spearheaded this initiative with grant support from the Iowa West Foundation and Pottawattamie County Community Foundation, matched by the generous support of individual donors and sponsors. Winter of 2012, renowned glass artist Therman Statom and ceramics artist Deborah Masuoka spent seven weeks as artists-in-residents at the Kanesville Alternative Learning Center. The artists lead students through brainstorming and design sessions that combined art history, technique, public art design, collaborative challenges and experiences, and themes of empowerment, voice, leadership, and what it can mean to be civically engaged. 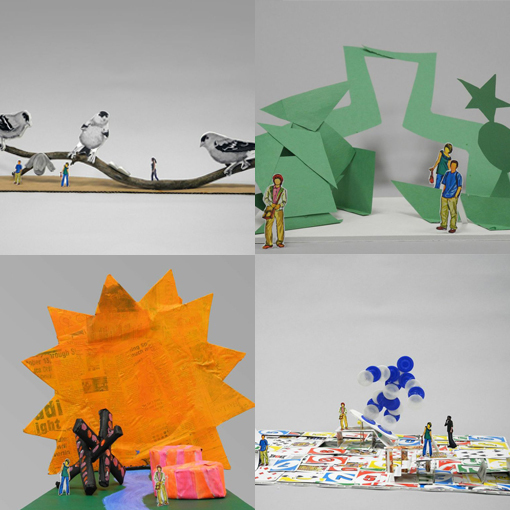 During the residency, students created scaled-models of their own thoughtful ideas for public art projects. The students also took part in creating a collaborative mural that was permanently installed in Kanesville’s gymnasium. This project focused on portraying mood and emotions through use of color, abstract designs and recognizable symbols and images. These visual models along with the students’ conversations, ideas, and reflections became the fuel and inspiration for a full-scale public art project soon to be installed on school grounds.